I wish I could finish the story I started in last week’s newsletter and tell you where my daughter is doing her Internal Medicine residency, but I am writing this newsletter a week early and I don’t have a crystal ball. So, I’m going to turn the tables. What’s good that’s happening your life? Let me know by reply email. Robert Lee Frost (1874 – 1963) is one of America’s most famous poets and a four-time Pulitzer Prize winner. His poetry is both traditional and experimental, and often memorized by school children. He once stated that his goal was to write “a few poems it will be hard to get rid of.” Explore these sites and his work, and let me know if you think Frost succeeded. American Poems’s Robert Frost page starts with a biography linked to related poets (including Carl Sandburg and Ezra Pound) and ends with a listing of 108 poems, sorted by volume. What’s unique here is that each poem includes comments posted by readers. Like all online public commentary, some of it is worthwhile, and some is not. Another fun feature is the ability to email any of the poems to friends and family. Modern American Poetry is the online companion to “Anthology of Modern American Poetry” from Oxford University Press. It contains literary criticism on thousands of poems from hundreds of American poets, and is a great place to peruse before writing your high-school or college English paper. In fact, if you are particularly proud of your finished paper, you can send it in (see instructions on About the Site, linked from the home page) and perhaps get published. 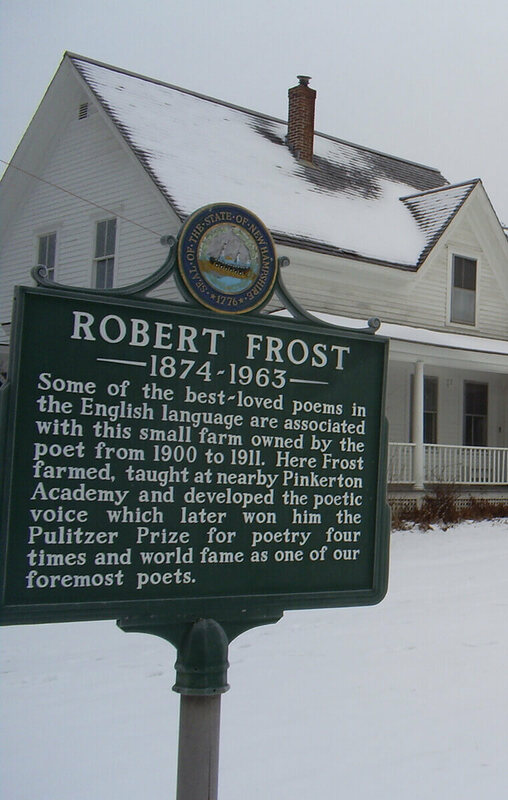 “Frost’s first book was published around the age of 40, but he would go on to win a record four Pulitzer Prizes and become the most famous poet of his time, before his death at the age of 88.” Visit Poetry Foundation for a rich collection of Frost resources: a biography, podcasts, articles, videos, and (of course) poems. “A poem begins as a lump in the throat, a sense of wrong, a homesickness, a lovesickness.” ~~ Robert Frost ~~ (March 26, 1874 – January 29, 1963) American poet. Click this link to read more quotes from Robert Frost.